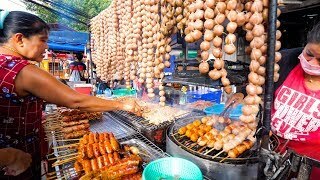 This video begins an ultimate Thai food tour of Chiang Mai, Thailand. 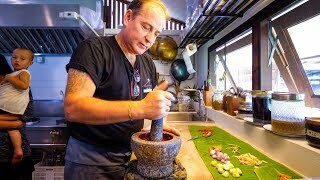 Get ready for some incredibly delicious Northern Thai food! Khao soi (ข้าวซอย sometimes khao soy), or curry noodles, is one of the most popular Thai dishes in northern Thailand. 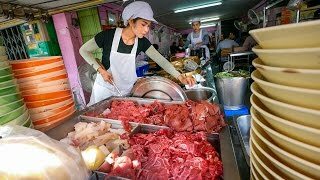 It has a very unique history and though details are not completely known, most say that it originally was brought from Yunnan, China through Myanmar, adapting along the way, and finally reaching Chiang Mai, where it’s become of the iconic foods. In Thailand though, is where the dish accumulated coconut milk, which is found in most version now. 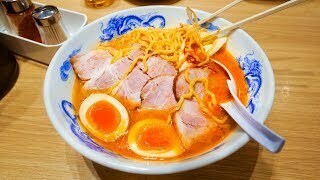 What is khao soi (ข้าวซอย)? Khao soi (ข้าวซอย) typically includes yellow egg noodles of some form, which are combined with a meat - usually beef or chicken (and I typically order beef as much as I can) - topped in coconut milk curry sauce, and finally sprinkled with coconut cream, and finally topped with crispy fried noodles. There’s a massive debate over who serves the best khao soi in Chiang Mai, and I don’t think it will ever be resolved because everyone has a different taste. But along with the help of my friend Tom (from Chaseki tea shop in Chiang Mai: https://www.facebook.com/chaseki.tea/) and Joel, we set off to eat 5 bowls of khao soi in a row to share with you what we think is the best khao soi in Chiang Mai, Thailand. 1. Khao Soi Islam (ร้านข้าวซอยอิสลาม https://goo.gl/maps/2WNVa3wKLkA2) - This is a longtime restaurant serving khao soi in what is known to be quite a traditional version. 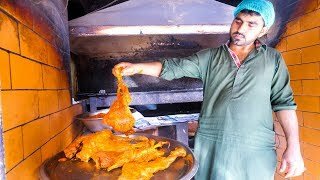 It’s a Halal restaurant, and their beef is amazing, but the curry is quite mild in spice. 2. 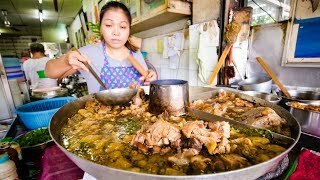 Khao Soi Khun Yai (ร้านข้าวซอยคุณยาย https://goo.gl/maps/aRbmm7qkm3S2) - Next we went to Khao Soi Khun Yai (ร้านข้าวซอยคุณยาย), what was many years ago one of my favorite bowls, but this time? 3. Khao Soi Loong Prakid Kad Gom (ข้าวซอย ลุงประกิจกาดก้อม https://goo.gl/maps/MhZKa5Thyew) - Many locals from Chiang Mai recommended I check out Khao Soi Loong Prakid Kad Gom (ข้าวซอย ลุงประกิจกาดก้อม), and it was amazing. The size, and the taste were spectacular. 4. Khao Soi Mae Manee (ข้าวซอยแม่มณี https://goo.gl/maps/RycqaMT87B12) - About a 10 minute drive from the center of Chiang Mai we found ourselves in a neighborhood for our fourth bowl of khao soi at Khao Soi Mae Manee (ข้าวซอยแม่มณี). The Aunty was so friendly and I watched her as she assembled our bowls, amazing. 5. 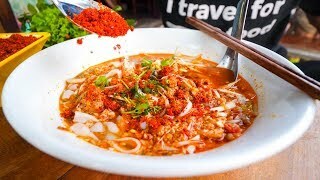 Khao Soi Mae Sai (ร้านข้าวซอยแม่สาย https://goo.gl/maps/otMCykopQjr) - Finally, to end this best khao soi tour of Chiang Mai we went to Khao Soi Mae Sai (ร้านข้าวซอยแม่สาย), what is one of the most popular restaurants to eat khao soi in Chiang Mai. 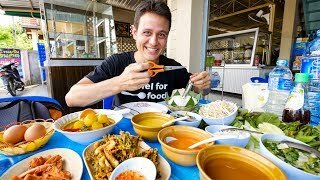 Make sure you watch the entire video to find out the best khao soi in Chiang Mai!